"I always make deviled eggs to use up dyed hardboiled eggs from Easter, but many family and friends hate the mayo taste and texture. 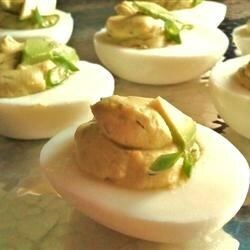 I tried an avocado base and it made the best deviled eggs anyone had tasted. You just can't be afraid of green eggs and ham." My son hates mayo, so I thought that he would like these deviled egg. I was right! These are a big hit. Very creamy. I can not really taste the avacado. Best deviled eggs I have ever had.